The Mistah has this habit that drives me kinda batty. When we sit down to eat, he’ll say, “So tell me about this”. I know this is his way of expressing interest but what I want to say most of the time in response is, “It’s a hot plate of food, now hush up and eat before it gets cold”. When I served up Chicken and Mushrooms, I jumped ahead in our usual script. As I handed him his plate, I said “It’s chicken and sauce.” You see, another peculiar habit is his fascination with ‘sauce’. Doesn’t really matter what kind, he’s into sauce. And if a dish isn’t served with some, he’ll go rooting around in the refrigerator to see if there isn’t something of the sauce variety that he can put on his plate. This has seriously led to more than one uncomfortable silence at the table after he’s doused something in soy sauce. So it really didn’t matter what else I said. Sauce was the magic word he needed to hear. BAH Note: This is one of those dishes that tastes even better the next day. You might want to just go ahead and make a double batch to make sure you have some tasty leftovers. Dry the chicken with paper towels and season with salt and pepper. Heat half of the oil in a dutch oven over medium high heat. Brown the chicken on both sides, working in batches if necessary. Transfer the browned chicken to a plate. Add the remaining oil to the pot and cook the onions until they begin to soften. Add a quarter cup of the chicken broth to get any browned bits off the bottom of the pot. Add the mushrooms and cook for 5 minutes. Add the tomato paste and flour to the mushrooms and onion and cook for a few minutes. Add the wine and deglaze the pot. Return the chicken to the pot and add the and herbs de provence and the remaining chicken broth. It should come almost to the top of the chicken. Cover the pot and transfer it to the oven. After 25 minutes, remove the lid and continue to cook another 25 minutes. Carefully remove the pot from the oven and transfer the chicken to a plate. Set the pot over high heat and reduce the sauce until it thickens a bit. Turn the heat off and gradually add some of the sauce into the sour cream until it is loose. Add the sour cream mixture into the pot and stir to combine. 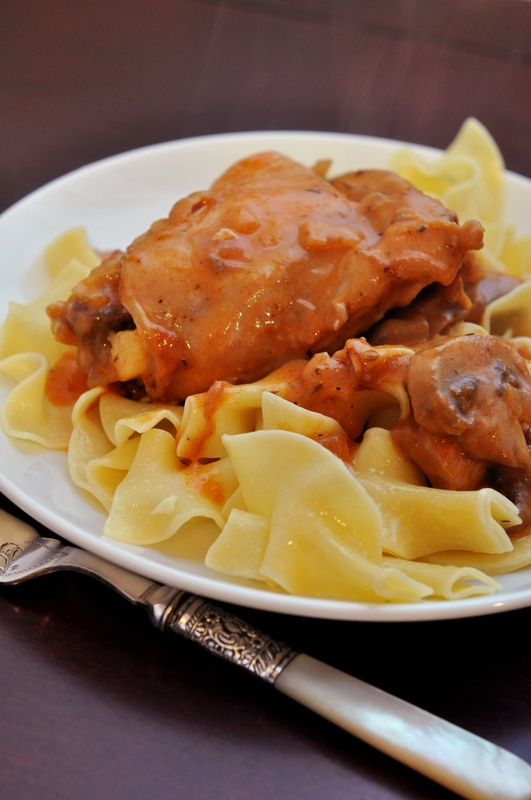 Return the chicken to the pot, coat thoroughly with the sauce, and serve over noodles. Hee hee – we are also sauce lovers in my house but there better be bread to sop up that sauce! Your photo is making me hungry. It reminds me of my mother’s chicken a la king & trust me, that is a good thing. Jennifer, the man is obsessed with sauce. I don’t understand it one bit. If a dish is supposed to have sauce, I will make sure it does. Otherwise, sauce is an inappropriate condiment. i love a great sauce too . . . but i draw the line at soy sauce . . . LOL!! Debra, the only thing soy sauce and I have in common is The Mistah. Otherwise, our paths would never cross. i am a sauce girl. and i am a big soy sauce fan. i once said outloud that soy sauce makes everything better and i know it’s weird to add it to something like spaghetti or mac&cheese, but damn if it doesn’t soothe whatever is ailing me. Lan, somehow you and The Mistah share the love of soy sauce on things God did not intend…like pasta. I’ve stopped trying to understand it. I like things saucy, too! This looks like a winner! It is definitely a winner. And one that satisfies saucy cravings. I admit that I have them every once in a while too. I love a sauce with sauce! I make few without some form of adult beverage as part of the mix and love that this qualifies. Sounds unfussy and delicious; the perfect dish. Barbara, unfussy is a great way to describe this dish. Cheers to you and your ‘saucy’ sauces! Oooh, I want this! I feel ya on the sauce. Only the hubs wants to put ketchup on everything. Perfectly good meat loaf swimming in ketchup. Oven-roasted rosemary potatoes dipped in ketchup. I’ve learned to just put the ketchup on the counter for him. Brooke, words cannot describe the pain that knowledge brings to me. What if you went to the fridge and…oops, there’s no ketchup. He’d survive right? That’s funny, because my husband is the opposite–he never asks about a dish. However, I usually want to talk about it! So I give him long unwanted descriptions of the ingredient list, process, my ideas for future improvements . . . poor guy–he just wants to eat! Jenna, how soon can the four of us have dinner? You can provide all the color commentary that The Mistah desires and your husband and I can just dig in and eat! It’s a brilliant solution. That sauce looks rich and creamy and delicious. I’m not surprised that The Mistah just dug in to this dish. Jen, I think I could have served him just a bowl of the sauce and he would have been more than satisfied. It is rich, creamy, and delicious. Tracy, this falls into my definition of comfort food. Saucy comfort food. Is that a guy thing? My Mistah lives for a saucy meal that he can dunk something bready into. I dunno Miss Mobtown, if yours does it and mine does it maybe it is a guy thing. MMMm sauce. Here’s hoping my next guy doesn’t feel the need to add hot sauce to everything! Elizabeth, I would have to draw the line at hot sauce on everything.